HomeMicrophonesShure SM7B dynamic microphone | BEST IN THE BIZ? In case you don’t want to read my super long but informative review, here’s the Quick Scoop on the Shure Sm7B dynamic microphone. The absolute go to mic for vocals. Used by a ton of people in the industry including Michael Jackson on his 1982 album “Thriller” as well as a plethora of other well known stars. It should be noted that Michael actually used the original SM7, but both mics are basically identical. Fantastic for voice over as well. Actually considered a voice-over mic first and foremost, it has a smooth natural sound that warms up your vocals without sounding artificial. Versatile. Does well with the aforementioned, as well as a variety of different instrumentation. Quiet. It is super quiet, and also rejects a lot of room sound that would otherwise be made apparent with a condenser microphone. Minimal EQ needed. So many people have reported finding success in one or two takes, and although the mic takes EQ extremely well, it isn’t really needed the majority of the time. Works perfect with the Cloudlifter in conjunction with an audio interface of your choosing. No separate preamps needed to power this puppy. Should be your first choice, and makes a perfect introduction into the world of microphones. A lot of trial and error with less expensive mics can be avoided by just cutting right to the chase and purchasing the SM7B. Frequency Response: 50 to 20,000 Hz. Switches: Bass roll off and mid-range emphasis. Slotted response selector switches. Microphone Connector: XLR. The difference between a USB microphone and an XLR microphone. Swivel Assembly: Integrated, captive nut for ease of attachment to stand, fits 5/8 in. -27 thread. Net Weight: 765.4 grams (1 lb, 11 oz). 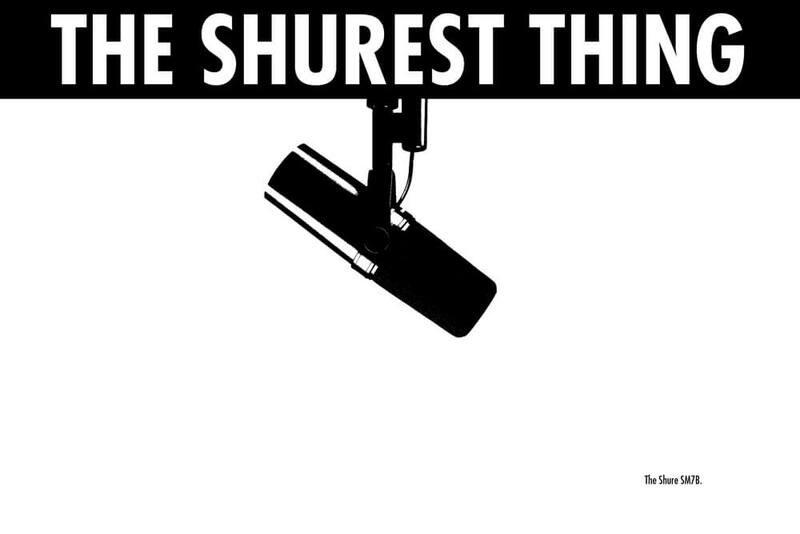 The Shure SM7B is a cardioid dynamic microphone that has really gotten around over the years. Condenser mic vs. Dynamic mic. Sort of like the village bicycle except not 😀 No really, you may have heard that Michael Jackson used an SM7 (basically the same thing) on his 1982 album “Thriller”, as well as “Off the Wall”, and “Bad.” Some other notables that have used it or the SM7B include Willie Nelson, Waylon Jennings, Johnny Cash, Red Hot Chili Peppers, James Hetfield from Metallica, Joe Rogan, Robin Quivers (Co-Host of the Howard Stern Show), Morgan Freeman, Jeff Tweedy (Wilco), Thom Yorke (Radiohead). It just may be the best vocal microphone there is, but also excels in a wide variety of applications including voice-over, instrumentation, pod-casting, etc. It’s been compared to the likes of a Nuemann U87 and some other mics in the thousands range. A/B tests from an amazon reviewer with the Shure vs. the Nuemann concluded that the Shure was indeed better. To me that’s pretty mind-blowing considering we’re talking about a “mid-level” microphone. One thing to note right away is that the overwhelming majority of reviewers say that it needs at least 60 dB of gain, which becomes clear when you look at the specifications above. It’s a low output mic and will need some extra juice. More on that in a bit. Versatile. Used in a variety of instances to fine effect. Adds a thickness and richness to the voice. Very smooth, with minimal to no EQ needed. Intimate tone. Still natural sounding. True to voice. Not a thin sounding mic. Has body. The “color” of the mic is tailored to the voice. The mid-range of this mic is said to be the strong suit because it’s a bit accentuated and warm. Comes with a built in shock-mount and foam windscreen. Can also be used with a pop-filter. Controls sibilance. What does Sibilant mean? Very quiet. It’s ambient/room noise is dramatically reduced down to almost nothing. Good for live room recording. Compact, as well as heavy and durable. This isn’t a mic that you’re going to be replacing any time soon. May be a tad muddy in the lower registers. Noise floor may not be perfectly quiet. There’s a slight scoop in the 400-900 Hz region, and a slight boost in the 1-2kHz range. It still sounds natural despite that. Announcing, broad-casting, vocal performance and vocal recording, Pod-casting, You-tube. Male vocals, rock vocals, very versatile. Scream all you want into this puppy, it can handle your nasty mouth! Bass cabs, Kick Drums, Snares. Trombone, Flugelhorn (yeah that’s a thing), Unmuted trumpet. A good preamp, or the juicy and exciting alternative solution. More on that in Stu’s notepad. Studio monitors (not mandatory but highly recommended). What are studio monitors? Some sort of Mic stand. Bit depth vs. sample rate (How your computer processes sound!). This is truly a vocal mic first and foremost. It enhances the voice with depth and richness, and filters out pops and unwanted percussives. It’s very directional and selective, and rejects room ambience and background noise, unlike most condenser microphones. It captures a broad spectrum of sound very clearly. It’s heavy and rugged, and the capsule is surrounded by a truncated, cone-like metal screen enclosed on all sides. The screen is like the kind you see behind microwave oven doors. What is a cardioid capsule? Perhaps my most important note: You will need at least 60 dB of gain to get a proper level out of this mic. Please do not underestimate this point. Now the good news is that you don’t actually have to dish out the big bucks for any of those more expensive preamps that I mentioned, unless you really want to, and/or plan to upgrade mics in the future. Of course, a nice preamp is always good to have, but it isn’t necessary in this case. Preamp vs. Interface. Why? Because Cloudlifter bro. The Cloudlifter in essence will give you 25 extra dB of clean gain. So if you’ve already got a Focusrite Scarlett 2i2 sitting around, or a 2i4, or a Solo, you can bypass a preamp and just get the Cloudlifter. The 2i2 has 46 dB of gain already. Add 25 to that, and you have plenty enough to power the SM7B. Whew!! Why is this cool? Because money. Lol. Let’s say you went the 2i2 route. BOOM. That in essence is your chain, and according to a ton of people online, it’s the perfect solution. Swap out the 2i2 for any interface of your choosing (if you want), and you have a match made in heaven. Check out my Focusrite Scarlett 2i2 Review! But what if you went the expensive preamp route? Your final cost would likely be into the thousands. The Cloudlifter route enables you to bypass having to throw all of your monies at peeps. That said, all of the preamp recommendations in What you will need work phenomenally well. Just know that you don’t have to get one. The Cloudlifter solution above works great too! A lot of folk were saying that they love the SM7B on flat settings, with no effects so they can EQ later. You should play around with the on-board settings on the mic (mid and presence boost) to see what tickles your fancy! Mic positioning is important. One reviewer said: position your grill (mouth) at palms width from the tip of the mic, and point it at your upper lip. This is the supposed sweet spot. If you aim it too high, you may sound nasally. Aim it to low and you’ll sound like you have a stuffy nose. Only one reviewer went into this much depth, but it’s interesting nonetheless. Being that this is a dynamic microphone, it won’t sound as open and airy as a condenser. It takes EQ well (as mentioned earlier), and if you want, you can EQ that type of condenser sound in later. Removing the foam and using a pop filter yields more high end (treble). In some cases, you may not like the sound of the SM7B with a pop-filter, as it may become sibilant past the 5kHz region. Starting with a bad mix that is too bright makes the mic sound dull and muffled. It rejects room noise fairly well, and certainly more so than a condenser. It rejects what’s behind and to the side, but it’s very sensitive in the front. It’s always advantageous to treat your studio space well. Check out my post on Acoustic Sound Treatment! Some foam panels and bass traps go a long way in a studio! It accurately articulates speech. While a large diaphragm condenser microphone will in essence smooth things over, the SM7B will be enunciate more. It picks up sound differently than a condenser. You could in theory EQ the SM7B to sound like a lot of different condensers, but you cannot fully mimic an LCD’s smoothing over response to vocal articulations. Why? Because the sound field is different. Is that good or bad? It depends on if you want your vocals to sound more dynamic and upfront (Dynamic mic), or more streamlined and integrated into the mix (Condenser mic). The differences however are very subtle. For my last point: In purchasing the SM7B, you may bypass all of your sub $100 mic problems, and save money in the process. That’s not to say that there aren’t good options in that price range, but the SM7B is the cream of the crop. It’s the Gold Standard for vocal mics hands down. It’s what people have been turning to for decades, and it gets nearly perfect reviews everywhere you look. An absolutely fantastic vocal mic that many say is the best dynamic mic on the planet, in it’s class or otherwise. Competes with mics way out of it’s price range, and has been featured on countless albums, as well as radio shows and the like. Adds a color to your voice that still sounds natural, despite not being completely neutral. If you’re looking for the absolute best vocal mic, look no further. This has been considered the go to for a long time, and remains a Gold Standard for microphones even though it’s price tag would say otherwise. People absolutely drool over this piece, and for good reason! If you’re looking for a mic that has a bit more high end clarity in regards to rap vocals, you may check out the AKG C214. It does to my ears sound a little better than the SM7B, but it’s pretty close. Well that’s about it for today my friend! I’ve answered everything you wanted to know about the Shure SM7B Dynamic Microphone. Additional Questions? Comments? Requests? Did I miss the mark on something? Please let me know below or Contact me!! What do you think about this bad boy? Let me know as well!! An excellent and thorough review of the Shure SM7B Dynamic Microphone. If this mic is good enough for the likes of some of the folks you mentioned in your post, it surely is good enough for my use! Personally, I use microphones mainly to record voiceovers for my videos, but since I am considering entering the podcast world, I have been searching for he right set up, hence my stopping by here today. Thanks for letting us know that we will need to consider some ancillary items to make this mic work properly, the solution you have come up with that costs $650 total seems perfect and in my price range. Hi, I recently bought the Shure SM7B, and I’ve been having a lot of trouble with noise. I bought the Scarlett Solo to use with it (which I believe has the same specs as the 2i2 minus some output/inputs) and its picking up a ridiculous amount of noise. The solo itself doesn’t have enough gain to handle the microphone, so I bought the ART Tube MP/C preamp to use alongside it. I found the preamp fixes the problem but also amplifies the noise along with my voice. Is this a problem with my mic, my interface or my preamp? The Art Tube does provide 70dB of gain, but isn’t the quietest preamp around. So I would say it’s both the interface and preamp. The Solo doesn’t have enough gain, while the Art Tube is just noisy. I would look into a different preamp or try the Cloudlifter or Triton Fet Head in conjunction with your Scarlett Solo. The Cloudlifter provides an extra 25dB of gain while the Fet Head adds 20dB. Hi, thank you for your really helpful article! The Behringer UMC404HD is a great alternative and give you 4 XLR ports with MIDAS preamps for a bargain of a price. In my ears it even sounds better than the more expensive Focusrites. Thanks for your input! I will have to check it out. Looks pretty amazing. Fantastic review! I’ll soon be starting a solo podcast and for my equipment I’m considering buying the Shure SM7B and Focusrite Scarlett Solo 2nd Gen. Do you think the cloudlifter CL-1 is also necessary? Yes the Cloudlifter should be used to add the necessary gain for the SM7B as mentioned in the article. Thanks for the nice comment man!